Mignolet did not have one save to make all game in what was a comfortable day for the Reds defence. The Belgium looked composed with his feet, making some good long balls forward. 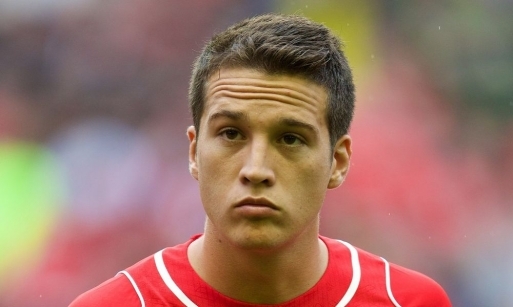 Manquillo was making his debut at Anfield, but it did not show. The young Spanish star looked comfortable on the ball going forward, making some surging runs forward, but also made some decisive challenges at the back for Liverpool. Manquillo would have impressed Rodgers with this showing and has put in a challenge to start in the league opener against Southampton. Skrtel had a very comfortable day in the heart of defence, but showed that his partnership with new signing Lovren could be key for Liverpool this season. Skrtel won everything in the air and has earned a start next week after his pre-season form and for being Liverpool’s best defender last season. 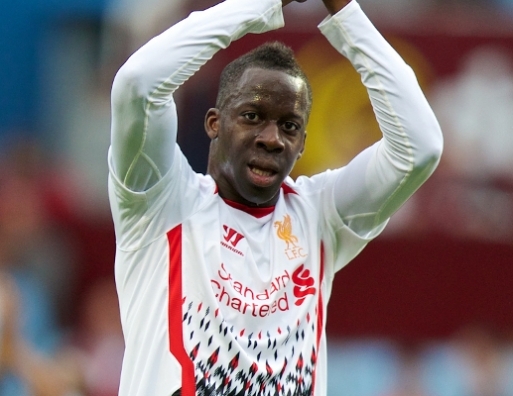 The new 20million signing proved what he can give Liverpool this season after an impressive debut. Scored the Reds second goal with a powerful header and also played a part in the first goal with a great pass for Coutinho to flick it on to Sturridge. The Croatian showed real composure on the ball and leadership at the back, making a number of great tackles at the same time. Got a great cross field pass, very similar range to Steven Gerrard surprisingly, and could prove a threat in an attacking sense as well. Johnson has drawn a lot of criticism for his performances lately, but today was much more of a composed performance at left-back for Johnson. Galloped forward well and proved a threat to the opponents, but also did his defensive duties well at the other end. Kelly did not have long to make an impression on the game but is far down the pecking order at the moment with Johnson, Flanagan and Manquillo all ahead of him. Needs to up his game if he is to have a future at Liverpool, but has not impressed too much this pre-season. Enrique is gaining fitness with every game he plays but he could have some real competition in the shape off Alberto Moreno if he signs this week. The Spaniard will prove to be a valuable player this season, even if he doesn’t play every week. Henderson has proved this pre-season and last season how important of a player he has become to Liverpool. His energy levels are unmatched and he could easily play 90 minutes every day, such is his fitness. 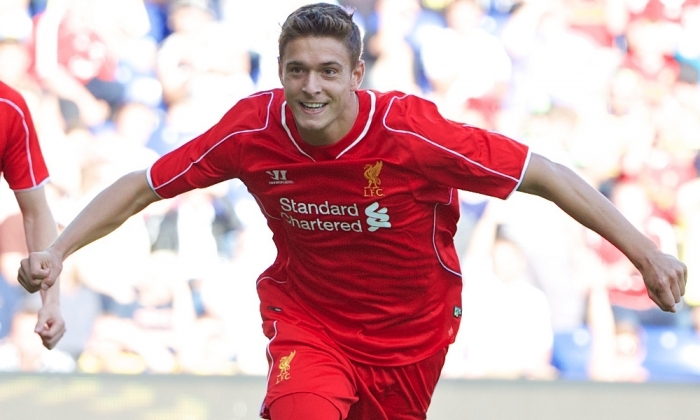 Scored the Reds fourth goal with a tap-in but has proved in pre-season he could score more goals this season. Henderson is one of the first names on the team sheet and that has proved how far he has come, thanks to his attitude. Can has impressed a lot of people during pre-season with his strength and speed, but today he could not get involved in the game as he would have liked. Can needed to do more to put his name on the team sheet next week, but is still in for a shot to start. Gerrard is proving to be very consistent in his new position and rarely has a bad game now. 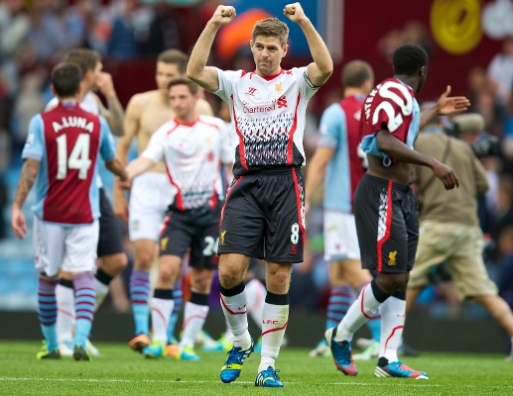 The Liverpool skipper controlled the tempo of the game, with Dortmund unable to deal with the passing range of Gerrard. 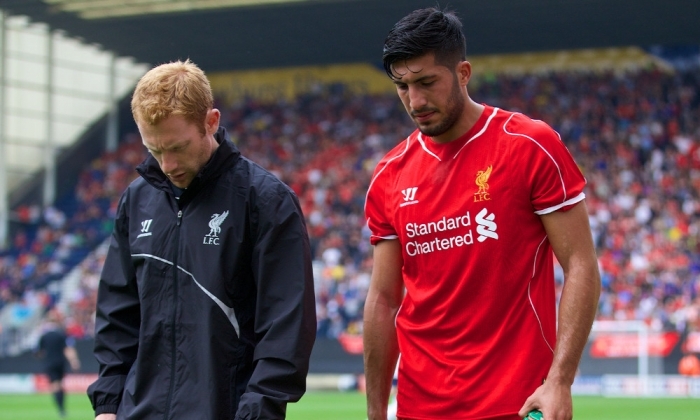 Came on for Emre Can in the second half and did a good job in protecting the back four. Lucas could not get into the game in an attacking sense which is why Rodgers would prefer to play Allen, Lallana. Coutinho or Can in that position as Lucas is too defensive. The Brazilian has a knack of giving away stupid fouls in bad areas, something he needs to cut out of his game. 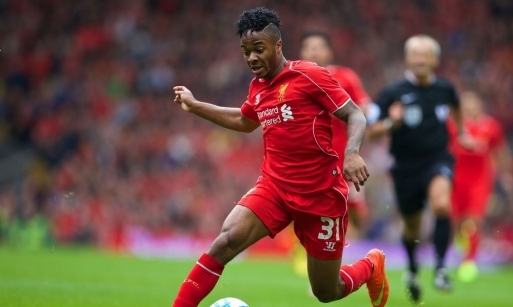 Sterling produced yet another impressive display with Dortmund unable to handle his pace. The 19-year old could be a big player for Liverpool this season and is starting to produce more goals and create chances for other players. Sterling seems to have improved on his defensive skills after tracking back to help out Johnson well, and showed unbelievable strength for such a small lad. 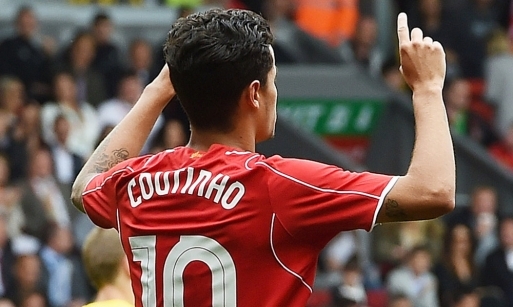 Coutinho pulled the strings for Liverpool today with everything Liverpool produced came through the young Brazilian. Scored the third goals of the game with a neat finish, something he needs to work on still, but what was more impressive was the flick to Sturridge to open the scoring. 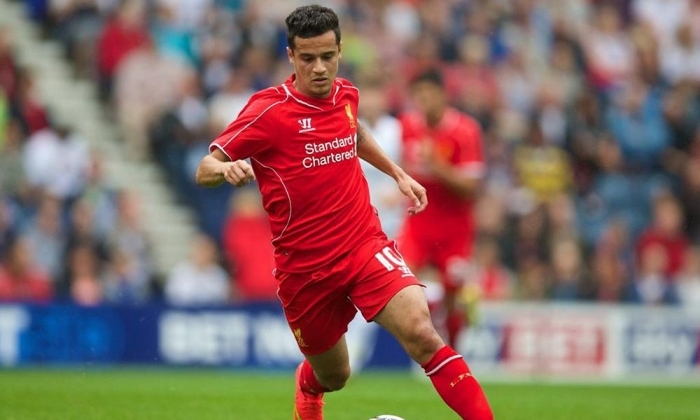 Coutinho has been described by Rodgers as the ‘brain of the team’ and that was proven with this performance. Ibe came on at a time where there was a number of substitutions that affected the game. Could not get involved in the game while he was on the pitch but this could still be the 17-year-olds breakthrough season this year. With their being so much talk about replacing Luis Suarez Liverpool already have the perfect player to fill the Uruguayans boots. A delightful outside of the foot finish for the first goal of the game and a wonderful piece of skill and pass to find Henderson for the Reds fourth goal proved he could step up even more this season. 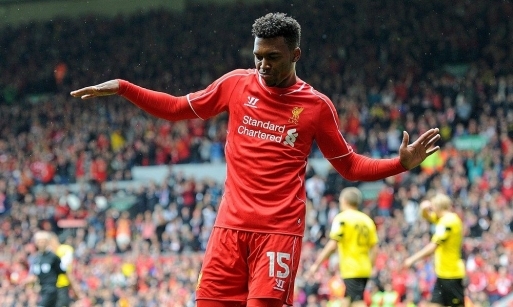 If Sturridge can stay fit all season then he will be the man to get the goals that Liverpool need. Lambert came on late in the game but once again another uninspired display by the Englishman. With Lambert struggling at the moment Liverpool are in the market for another striker to partner Sturridge or be back up and Lambert does not fit the bill. Good player to have on the bench but would not inspire confidence in Liverpool fans if he were to start for Liverpool this season. A good performance from Brad Jones, could not do anything about the goal. Made a number of good saves throughout the game and looked confident when collecting crosses. Did not look sharp for the second game in a row and lost a number of balls in the first half. He Will need to improve if he wants to impress Rodgers. Flanagan was Liverpool’s best defender in the first half. He looked comfortable on the ball and attacked more in his natural right-back position, when he swapped positions. Flanagan looked comfortable in defence and would have impressed Rodgers so far. Did not have a lot to do but was guilty of being complacent throughout the match. Skrtel looked strong in the air as normal, but did show rustiness a few times throughout the match. Wisdom did not have a good day and it is no surprise that Rodgers does not consider Wisdom in his first team plans. Looked weak on and off the ball and lacked pace a number of times during the game. A loan spell in the Premier League will suit Wisdom well. A much better appearance for Stewart as he looked more comfortable on the ball, and did not give away the ball. In the last game he gave away the ball for the goal and never looked like a player that was confident, but this was a much better run-out for the young full-back. Did not have a lot to do when he came on the pitch but whenever called upon he produced. He looked strong and comfortable on the ball, Coates showed that he has gotten over his injury but whether Rodgers considers him in frame for the first team is yet to be seen. Helped tighten things up at the back and worked well with Coates. Very comfortable but did not have a lot to do when he came on. Did not really make an impression for himself and was replaced by Enrique later on in the game. Did not go forward many times but did look comfortable defensively. Only made a short 20 minute appearance, but did show his quality during that time. Gave Liverpool another option going forward and looked fit and raring to go for the new season. Made some very good tackles while on the pitch, but if he is to fit into Rodgers plans then he will need to be better on the ball, as he gave away the ball a few times. Looked lively defensively and did help out the defence well. Only played 20 minutes due to him being taken off as a precaution. During those minutes he controlled the tempo of the game and looked comfortable on and off the ball. An impressive brif appearance and if he can show this in the Premier League he could be in for a big season at Liverpool. Showed what he is all about and another impressive performance from the Brazilian. Showed great feet, dominant on the ball and surprisingly show better strength. 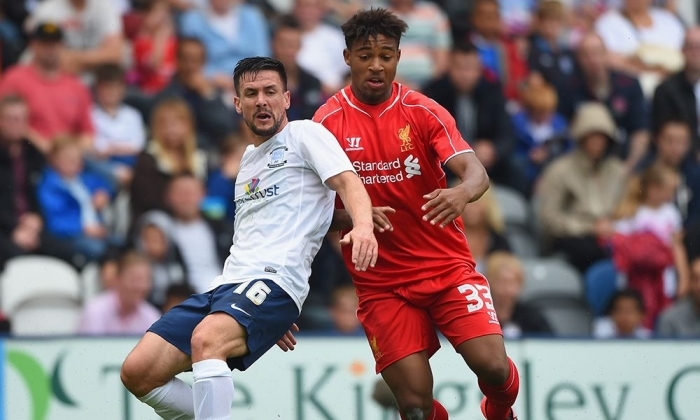 A great performance again by Jordan Ibe, adding another 2 assists to his name. Great runs for both off the goals and showed real determination to get into attacking position. Got a very good pass on him, but again needs to improve his finishing as he had a great chance in the first half. Coady is a very good tackler of the ball and made a difference when he came on. Looked comfortable on the ball and made a few bursting runs forward, overall a good performance for Coady when he came on. Made a real difference when he came on the pitch. Made some great tackles and ran the show in the midfield when he was on the pitch. Still only 18 and could have a good future at Liverpool if he can progress to the next level. 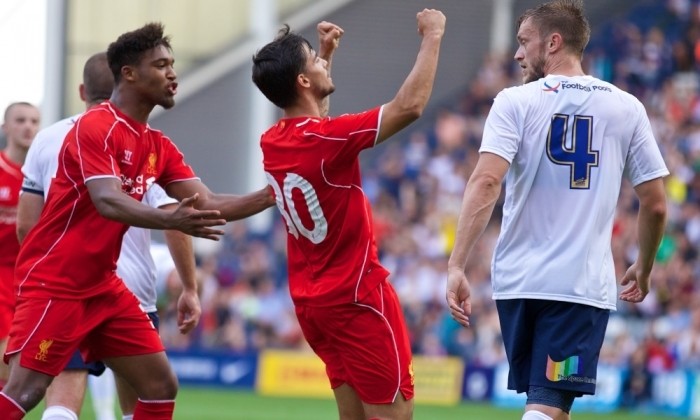 Suso impressed on the left side of midfield, scoring a great curling equalising goal. Cut inside on his left foot and looked a danger when he did. Got a good shot on him, as he showed with the goal and has an eye for goal, could be a good player for Liverpool this season. Phillips played just the 10 minutes, so not really a lot of time to make an impact on the game. Did not have a lot of touches on the ball as Liverpool were seeing the game out when he came on. Looked comfortable on the ball and showed good link up play with Peterson. Did not see a lot of the ball but when he did he would rarely play a bad pass. Lambert did not see a lot of the ball, but did show glimpses off what he can do. Will need to improve his performances if he is going to make the starting eleven and perhaps at times showed the occasion got to him. Borini is on the verge of a move to Sunderland and this is likely to be his last appearance for Liverpool. Showed that his head was not at Liverpool and did not make an impact on the game. Peterson Liverpool boss Brendan Rodgers what he is about, scoring the winning goal of the game. 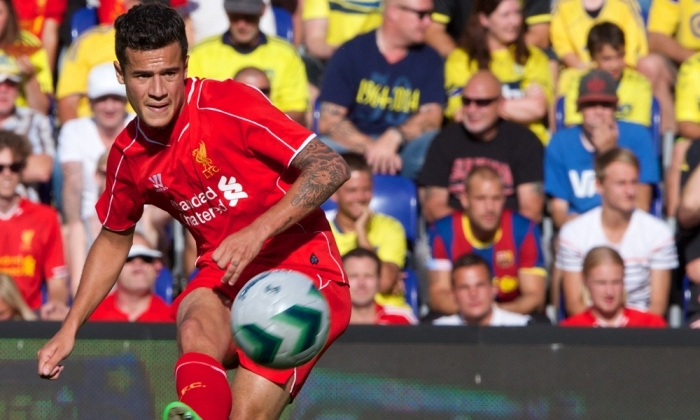 Scored in the loss to Brondby and showed his poachers instinct for his second Liverpool goal. 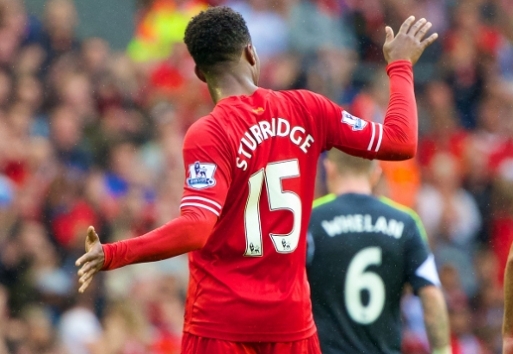 Made some great runs throughout the game and showed that he links up extremely well with Jordan Ibe. Who impressed you? Take part in the poll or have your say by commenting below. Started brightly, but was caught out for the goal where he was out of position for the long range strike and constantly got beaten at free-kicks, with the Danish side hitting the crossbar twice with Jones of his line both times and lucky not be beaten. Didn’t get too much game time as he replaced Jones late in the second half, could do nothing for the goal, but didn’t have a lot to do. Looked rusty and showed that he has not played much football. 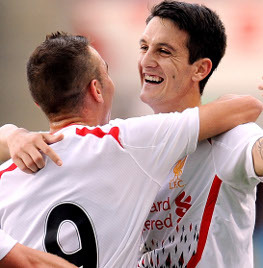 Brendan Rodgers will want Kelly to up his game if he is to be considered in Liverpool’s first team plans next season. Replaced Tiago Ilori midway through the first half, had a horrendous start where he gave the ball away for the first goal and giving the ball away in attacking positions. Replaced at half time. Looked assured during the 20 minutes that he played, but went off injured after appearing to pull a hamstring. Agger returned to Denmark to face his former club and captained the Liverpool side, looked assured without looking spectacular. Showed his rustiness at times during the game. Made some very good attacking runs, but was caught out of position at the back several times. Got forward and showed he has a lot of pace, but will need to pick his moments to go forward better. Didn’t have a lot to do, but should have put in a tackle for the goal. Showed his strength and was very good in the air, winning most aerial balls. Came on in the second half and looked very sharp. Made some excellent runs going forward and showed real determination in the way he went about his work. Liverpool’s best defender on show and should start next season. Came on in the second half and showed why Liverpool are willing to loan him out. Did not look comfortable on the ball and was sloppy at the back. Lost the ball a number of times and did not put in a good performance to prove Rodgers wrong. Came on in the second half and did not have a lot to do, was partly at fault for the goal as he should have put in a tackle. One of the senior players on show at the game and looked rusty, did not get into the game and did not work hard enough. Came on in the second half and could not get into the game, looked weak on and off the ball and showed none of the performance levels he played at last season, where he replaced Coutinho at times in the season. Made some good forward runs and looked lively during the game. Left out of position during the game a few times. Showed some very good touches and looked lively, showed good link up play with other players and needs to start making the step up now for Liverpool if he is to succeed. Linked up well with Coutinho and looked lively during the game, showed no rustiness and was a threat to the Brondby defence in the first half. Ran the show in the first half, everything that Liverpool created in the first half came from Coutinho. Showed no signs he was rusty and showed Rodgers what he has to offer. Had a steady performance without really showing Brendan Rodgers what he can do. It is rumoured Liverpool are willing to let Coady leave and he will have to perform better to convince Liverpool to keep him. Came on in the second and did not make much impact. Could not get involved into the game and needed to keep the ball better for Liverpool to keep possession. Very similar game to Adam Phillips where he was sloppy on the ball and needed to keep it better for Liverpool to cause more problems. Came on for the second half and showed what he is about. Ibe has unbelievable pace and trickery and showed it to set up the Liverpool goal, with a clever dummy which the defender fell for and Ibe was clear to put the ball on a plate for goalscorer Peterson. One improvement he needs to make is his finishing which is woeful at times, but he is definitely one for the future. Needed to impress today but could not get involved in the game, showed rustiness and he will need to pick up the performance levels with every game if he wants to impress Rodgers. Peterson was in the ‘right place right time’ for the goal, which takes a certain skill. Looked lively during the game and linked up with Ibe well. 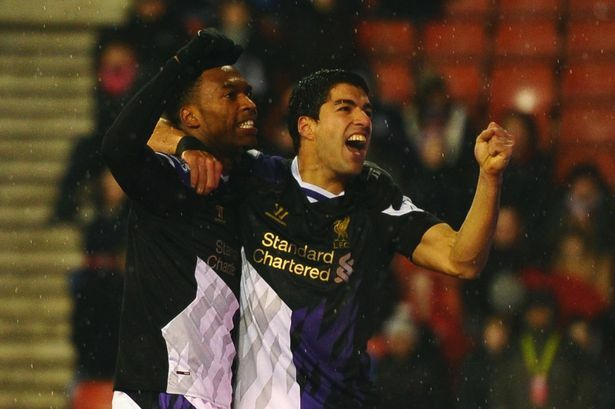 Liverpool won at the Brittania stadium in an enthralling encounter which finished 5-3 to the Reds. Rodgers was keen to praise that attacking play that Liverpool produced, but also wanted to address the problems that Liverpool had at the back. Liverpool cruised to a 2-0 lead thanks for a own goal from Stoke defender Ryan Shawcross and Luis Suarez latching onto a loose back header from Shawcross, but Liverpool were pulled back to 2-2 before half-time thanks to goals from former Reds Peter Crouch and Charlie Adam. Liverpool then took the 4-2 lead through a penalty from Steven Gerrard and Luis Suarez’s 22 goal of the season, Stoke then pulled the game back to 4-3 through Jonathon Walters to make for a agonising finish but Daniel Sturridge on his return scored the goal to finish Stoke off. 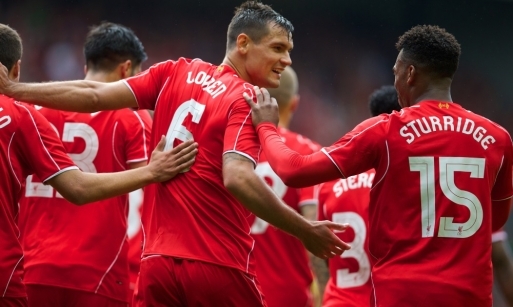 The Reds boss told Sky Sports: “I thought they were brilliant. To come here and get five goals and put in the work and the effort is fantastic. I’m delighted for the players. “We went out in the second half and we went again. That shows the character of the team. Liverpool’s third goal at the Britannia came from the penalty spot, after a contentious decision as Raheem Sterling went down under light contact from Marc Wilson. 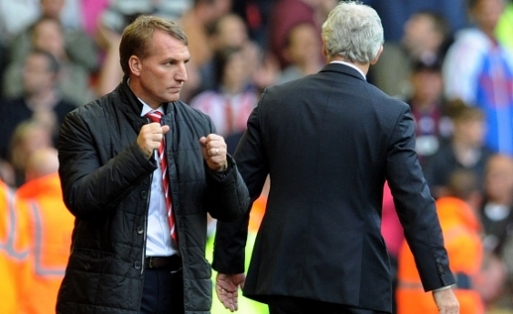 Rodgers accepts that his side were slightly fortunate to be given the decision, which infuriated Stoke boss Mark Hughes. He added: “I thought it was soft. It was one where, if you’re the attacking team, you’re happy to get it. “I’d call it a ‘Spanish penalty’, one where the attacker goes into the defender – the defender obviously doesn’t get the ball – but the contact puts him over. Liverpool boss Brendan Rodgers lavished praise on new Liverpool goalkeeper Simon Mignolet, after he saved a last minute Liverpool to help Liverpool to a deserving 1-0 victory over Stoke City. The Reds took a first half lead with a stunning 25 yard strike from Daniel Sturridge and looked on course to comfortably pick up the victory until Daniel Agger handled the ball in the penalty area to give Stoke a penalty. 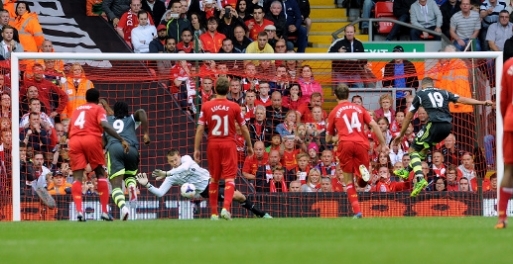 Mignolet saved the resulting penalty from Jonathon Walters, in the process rescuing all three points for Liverpool in their first game of the season. Rodgers told his post-match press conference: “He made three terrific saves in the game. He had one in the first half when Jonathan Walters had a great turn and shot and Simon stretched and got a strong arm to the corner on the left side. “Obviously when you don’t take your chances – and we created numerous chances and didn’t do that – and then get a penalty against you at the end, there’s sometimes that sinking feeling. “But he’d done his homework and knows exactly where all the penalty takers are going. It was a good first save and then obviously the reaction to get up and make the second save was impressive. “I think from that, you also saw the spirit in the team, what we’re trying to cultivate here as well and the energy and attitude of the players. Mignolet’s save prompted joyous scenes of celebration as Liverpool got the new season up and running with a victory. 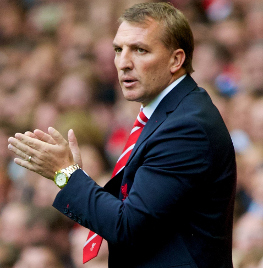 Rodgers added: “I’m delighted – I’m just delighted for the players. The work they put in over the course of pre-season and their focus and concentration amid everything that was thrown at them at the club, to come out and play like that, create as many chances as they did and get the win was excellent. Mignolet was not the only debutant in the match, as Kolo Toure and Iago Aspas both made their Premier League debuts for Liverpool. “Kolo introduced himself to the crowd when he jumped about seven foot five in the first couple of minutes of the game – it was a wonderful leap and I think you could see his energy and enthusiasm,” said the boss. “When we lost Jamie Carragher last year, we were losing real experience – but Kolo comes in and offers that. He was excellent. 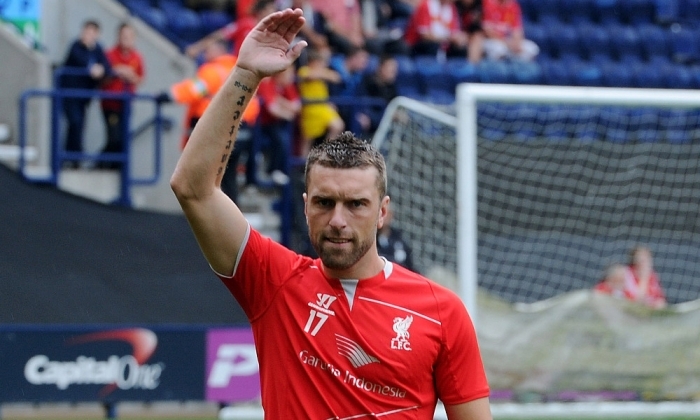 “Mignolet was very good and Iago Aspas is a real bright and clever player. In and around the edge of the box, he wants to shoot, he wants to combine with people and that’s something that’s important for us. I thought for 70 minutes he was excellent. Rodgers also praised Daniel Sturridge, who has only been training for two weeks and was rated at being eighty per cent fit for the match and played 90 minutes. “Considering he’s only been back just over two weeks from his injury, I think he’s a great credit,” said the manager. “He played 90 minutes in midweek in a game behind closed doors, so to come out and play another 90 today was really putting himself out there. “Just at the point before he scored, I’d made a note for him to maybe take more shots because our combination play was great. “It was a really good move, we showed great patience to pass and to probe to get the space. You saw Daniel’s power, he’s got a wonderful left foot and it was a terrific finish. He replied: “At the minute, the concentration is on the players who are available to play. Luis is doing his work and there’s nothing to be said there. For us, it’s about continuing with the momentum coming through from last season and winning games, which is what we’re here for. Rodgers continued: “I won’t be saying anything on Luis Suarez and it’s only purely out of respect for the players that are working hard at the minute. Liverpool begun the new season with a 1-0 win over Stoke City with a stunning 25-yard strike from Daniel Sturridge, with Mignolet saving Liverpool with a last minute penalty save. Liverpool dominated much of the match after hitting the crossbar three times during the match, emphasising how much they dominated. Mignolet made himself an instant kop hero by saving a 88th minute penalty from Stoke City striker Jonathon Walters. The excitement around the start of the season was emphasised by Liverpool’s bright start to the game, with the Reds hitting the crossbar and scoring an offside goal in the first quarter of an hour. Stoke had a great chance when Mignolet struggled to handle former Reds striker Peter Crouch and parried the ball straight to defender Robert Huth, who volleyed the ball onto the crossbar with a gaping goal. Shortly after, Liverpool were celebrating a goal through striker Daniel Sturridge from a brilliant free-kick from Steven Gerrard which found Sturridge’s head and the England striker put the ball into the back of the net, until the referee called for a, rightful, offside decision. Liverpool continued to press when a corner found its way to debutant Kolo Toure who blasted his header onto the crossbar, with Sturridge’s follow up going high and wide. Stoke goalkeeper had a sublime game and was called into action numerous times before Liverpool broke the deadlock. After Aspas hit the ball straight at the Bosnian goalkeeper, he found a sublime pass to find Jose Enrique who hit the ball straight at Begovic. Coutinho eye for a pass was evident again here in this match after he slid a ball through for Jordan Henderson, but Begovic rushed out to prevent Henderson from getting a left footed shot in. The brilliant Stoke keeper though was powerless to stop a sublime Sturridge strike as Liverpool finally broke the deadlock. Quick interplay in the Reds midfield found Sturridge who struck an unstoppable strike from 25 yards out and found its way into the corner of the net beautifully. The Potters kept on fighting though as Mignolet had to acrobatically get across his goal to prevent a curling effort from Stoke striker Jonathon Walters. 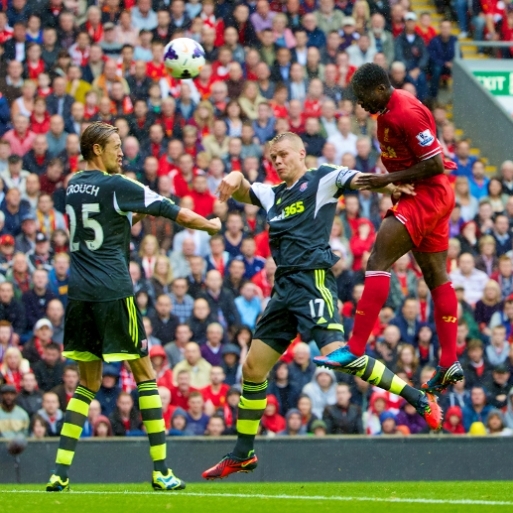 Lucas then had to nod a Ryan Shawcross header of the line to keep Liverpool in it going into halftime. Liverpool continued to impress in the second half as they looked for a second goal and were unlucky not have extended their lead before the hour mark in the match. Coutinho whipped in a cross and Sturridge failed to connect with the ball, but it fell to Henderson who blasted his strike straight at Asmir Begovic. 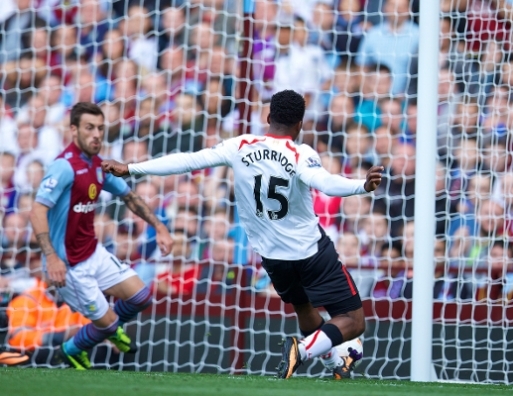 Sturridge then had a chance to double his tally when he fired the ball from a tight angle for begovic to knock onto the post. From the resulting corner summer signing Iago Aspas, who impressed, glanced his header just wide of the post. Aspas continued to impress as he teed up Jordan Henderson, who cut across the ball with a sweeping striker that agonisingly nailed the far post. As Liverpool closed in on the win, Daniel Agger was ruled to have handballed the ball inside the penalty box and Stoke were awarded a last minute penalty to level the game. Stoke striker Jonathon Walters stepped up to take the penalty and was dramatically stopped by a impressive penalty save from new goalkeeper Simon Mignolet, sealing a vital three points for Liverpool. In front of the club’s principal owner, John Henry, the Reds maintained their impressive form through goals from Luis Alberto, Iago Aspas, Martin Kelly and Raheem Sterling; their clean sheet record was ended by Giancarlo Gonzalez, though. The pre-match team news had confirmed nine changes to the Liverpool team which celebrated Steven Gerrard’s testimonial by beating Olympiacos on Saturday – Joe Allen and Aspas the two men to retain their starting berth. 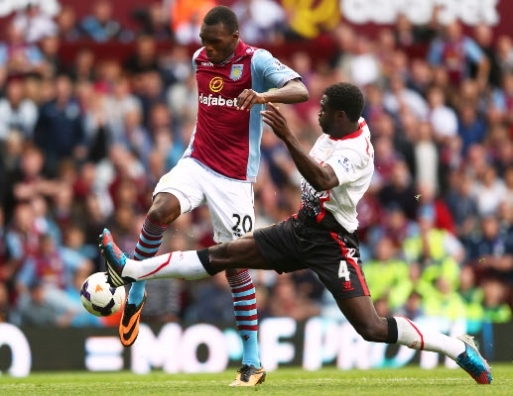 An incisive burst by Stewart Downing served notice of Liverpool’s threat to the hosts as early as the third minute. The winger knocked the ball around his marker and showed lightning pace to collect the ball on the other side, before drilling a centre which Jordon Ibe was unfortunate not to connect with. First-half captain Jordan Henderson whipped a free-kick high and wide in the eighth minute and Allen trained his sights with a wayward effort shortly after. Continuing the theme, Ibe skipped beyond two challenges to work space – a rash shot followed, though. A wonderfully slick passing move, prompted by Alberto, Allen and Downing, provided time and freedom for Ibe to work a reactive Kongshavn once more. If that save was impressive, his next was inexplicable. Jon Flanagan supported on the left flank and curled a perfect delivery into the area for Downing, who will still be wondering how his stabbed strike was kept out by the stopper’s head. But Kongshavn’s charmed goal was finally breached within moments. Aspas’ clever chip bounced away off the crossbar and when the Norwegians failed to clear, Alberto volleyed a precise finish into the bottom corner to secure a 31st-minute lead. Brendan Rodgers has stated that Suarez and Bale are not that far apart in terms of quality, and has revealed that if Madrid are willing to pay 100million for Bale then that is what it is going to take to prize away Suarez from Anfield. “Every single player in the world will be open to that, but it’s not something we’re thinking about, to be honest,” he said. “I was on the phone to the owners last night and they know what we’re trying to do here. 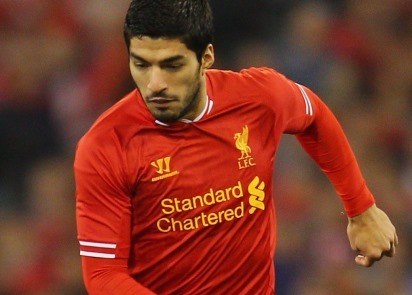 We’re trying to build the group up and we’re in no hurry to sell Luis or any other player. “Throughout the world, every player has a value and worth. You look at the market and £40,000,001 – when Gareth Bale they are talking about [a lot more than that]. “Gareth Bale and Luis Suarez were arguably the two best players in the Premier League last year and you can’t say Gareth Bale is valued at 100 per cent more! Asked if there was any update on Suarez’s future, Rodgers added: “There are lots of stories that are going on around Luis but there’s no change in it. “We’ve had two bids from one club. That was nowhere near the valuation in the market now for a top, top player. “Until there’s anything dramatic that changes he’s still in working. We’ve got to get him up to speed. “It’s very, very simple. We don’t want to sell him. He’s a top player and we’re trying to build something here. Rodgers has today reiterated the clubs desire to keep Suarez and was not surprised by the standing ovation Suarez received when coming onto the pitch. “It was probably not the reception that you guys thought!” the boss told journalists after the 2-0 victory over Olympiacos. “It just shows you the class of the Liverpool supporters. Maybe people wondered what kind of reception he would get but that’s the type of supporters Liverpool are. They love their own, and Luis is still very much part of the group and the team. “They’ve given him everything, the supporters here. “He was probably humbled by the reception. There might have been that wee bit of trepidation about the reaction he might have got, but people who’ve been at this club a lot longer than me and know the Liverpool way, they know the fans always respect their people and respect their own. “Today was another message from them that they love him here. We all love him, as a manager, players and supporters. We’re trying to keep our best players. “We only want players who are totally, 100 per cent committed to being here. I’ve spoken to Luis countless times over the summer and, of course, speculation can always be difficult for players, but he’s back training and playing. “The more he’s around the group, the more he’s around the great support here… And days like today, and during the tour – if ever anyone wanted to know the status of Liverpool Football Club they did while we were on tour and today.